The Blog of Thog: Now live - The Journey: Part One! After all the buzz and excitement from last weeks post, it's time to let people out of their misery. 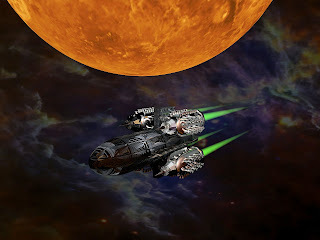 I and my fellow blogger, Tim Clark of the excellent Life, Explained, are going to write a science fiction serial, told from different points of view. Read below the first part of our sci-fi epic, and stay tuned to Tim's blog for part 2! Captain Anthony Danger of the Venture-class Earth Spaceship Tillerson, sipped his hot coffee. It had been a long, dull mission for the 80-strong team manning the long range vessel, sent on a low priority mission to explore a series of star systems. There had been little demand from Earth Spacefleet to send a ship at all, but a politician back home had been elected in the Mars 2120 elections on his promise to “Further the Exploration of The Cosmos!”, vowing to identify new mining sources and expand the scientific discovery programme. Once the politician had been elected, and discovered just how expensive deep space exploration was, he plumped for building the smallest scout ship he could and sending a somewhat mediocre crew of career spacers out in it, to go look at a group of star systems that, the scientists advised, could be relied upon to “not find anything too interesting that might result in a demand for prohibitively expensive research”. So far, they had spent a little over seven months investigating four stars, two uninhabitable planets, seventy two asteroids, and six comets, the last of which they had managed to drill and obtain a large sample of ice. The ice was asserted as being essential for scientific research, although it was worth noting that, apart from giving the science team something to look at, the ships galley was suddenly offering Long Island Iced Teas again. In the bijou square command bridge of the Tillerson, Captain Danger enjoyed a slightly nicer seat than the others, and was positioned in the centre of the room where he could easily turn to address any of the control stations. His second-in-command, Commander Anna Konetkov, had a seat alongside him. Each of them had a control display to the side. In front of them were a bank of three desks, for Helm, Sensors, and Communications/Combat (generally referred to as C&C). Behind them were ancillary stations for other ships functions such as Engineering control, Science, and Research. All stations ultimately faced a large display screen, which was currently showing an asteroid, an irregular two hundred kilometre rock slowly rotating in the darkness, a hundred thousand miles away. “Sendie, what’s in that rock?” Captain Danger asked. Sensor Operator Lieutenant James Send checked the sensor returns, before half-turning in his seat to address the captain. The crew sat in silence, some monitoring their various control panels, while others like C&C (which had spent at least 30 weeks of the 31 week journey bored to tears reading ships communications which covered important issues such as the monthly darts tournament) generally mucked about on games and simulators to pass the time. Eventually the dagger-shaped E.S. Tillerson got somewhat closer to the asteroid. Sensor data began to improve in quality. Lieutenant Send reported. “It would even have potential as a future base,” Commander Konetkov ruminated. Danger nodded. “Hang on,” Send said, peering at his display and poking controls. “What is it?” Konetkov asked, a moment before Danger could speak. “We’ve never encountered Curium naturally in space before.” Danger said, frowning. Konetkov rose and turned to address a woman at the Research station at the back of the command bridge. Great set up, sounds like this will evolve into a fascinating tale. Wonderful idea to pair off like this, looking forward to reading on!